I made Japanese curry today. I made it thick and lush with spices, heaped it high with carrots and mushrooms. I let it boil for hours, conscious of how the onions were turning into delicious mush. The apartment smells absolutely gorgeous. And I blame Sorcery Saga: Curse of the Great Curry God. Who knew a game could make you so obsessed with a food item? It all started sometime around the Christmas break. 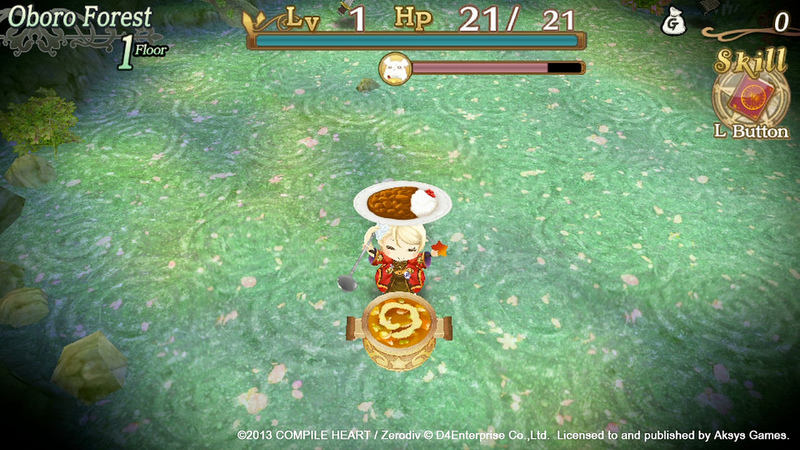 I downloaded Sorcery Saga: Curse of the Great Curry God onto my PS Vita, thinking it'd make for light, fluffy repast. Can you blame me? From the outside, Curse of the Great Curry God looks agonizingly twee. The leading lady's a blonde student of sorcery and an advocate of the spices. Through no merit of her own, she earns the privilege of traversing her school's Magic Tower (i.e: the tutorial area) in order to retrieve a magical orb. This, of course, doesn't happen. 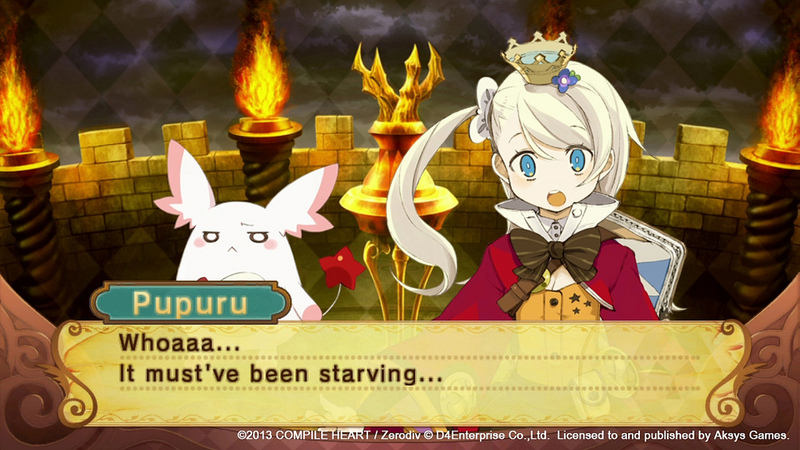 At the summit, the protagonist Pupuru ends up discovering that a squat, fuzzy creature, who she eventually dubs "Kuu", has eaten the artifact. In spite of its brazenly silly premise, however, Curse of the Great Curry God is no laughing matter. Under the armament of cute lies what is essentially, as they say in the business, a roguelike-like. Almost everything in Curse of the Great Curry God involves some element from the genre: the dungeon-crawling, the turn-based combat, the ability to die and lose everything you've ever held dear, the endless dying. All there. For a game swimming in chibis, Curse of the Great Curry God is surprisingly brutal. Not as vicious as, say, the eponymous progenitor of the genre but certainly in league with at least a minor devil. But enough vagaries. Let's move into specifics. Like any game worth its Metacritic score, Curse of the Great Curry God doesn't waste itself on unnecessarily complicated ideas. Exposition, after the initial deluge, is relatively sparse but exquisitely paced. The dungeon sequences are pretty straightforward. Pupuru, armed with whatever you're brought from the game's solitary town, begins every new labyrinthian adventure at level 1. From there, it's a question of moving from floor to floor in an upward spiral, ever vigilant for unidentified equipment and opportunities to level up, before finally engaging in a boss creature of some variety. Be nice to Kuu. He's going to be your new best friend. There's a bit of a twist, of course. Pupuru won't be gallivanting on her adventures alone. No, Kuu will be accompanying her. But while wondrously fuzzy and as useful as a Swiss Army Knife, Kuu isn't without his own needs. The ravenous furball needs to be fed. Constantly. Each blow he takes, he takes with his stomach. Pretty much everything will whittle at Kuu's hunger bar. Time. Combat. Walking. Naturally, it's your responsibility to keep him fed because even if you think you might do fine without him, Kuu is instrumental to your progress. If he falls unconscious from starvation, you won't be able to proceed to the next level. Luckily, Kuu is easy to care for. He'll eat anything. Anything at all. Swords, sticky rice, shields, blobs of goo you found on the floor, old scrolls -- if you throw it at him, he'll consume it. Take note. Not everything will replenish his hunger bar. Some items might actually damage it further. On the flip side, however, Kuu does accumulate experience points with every bite he takes and will sometimes even gain a boost to his attack or defense, depending on what you toss into his gaping maw. Kuu will even pick up random new skills at sporadic intervals. How nifty is that? (Ignore the fact his underlining A.I is a moody, irresponsible horror sometimes, will you?) While all of them are generally useful, some of these talents will seem more glorious than the rest. Eye of God (it allows you to instantly identify anything you pick up) is especially useful, given the fact that cursed weapons are a pain to get rid of. While Kuu operates to the beat of his own drum, Pupuru is yours to pilot. Unlike many of those engaged in sorcerous pursuits, our flaxen-haired lass is competent with both wizardry and weaponry. How you want to take on the hostile creatures you'll invariably encounter is, of course, completely up to you. Did you want to be entirely reliant on nothing but the razor-edge kiss of your blade and whatever poultices you find in a dungeon or be a Gandalf-in-training? Nothing is holding you you back. It helps, I guess, that combat is so straightforward. To use your melee weapon, you simply tap a button. Spells are slightly more confident. To rain frost and fire on your enemies, you'll need to first call in the spell wheel (with a tap of a button), check to see if you've ran out of uses, and then hit another button to implement your attack. Is there more? Absolutely. Pupuru's obsession with spice-laden cuisine comes with in-game benefits: the ability to cook curries during her dungeon runs. It isn't a complicated process; the curries you make will only demand three ingredients or so. But the benefits are considerable. (Unlike in real life, curries in Curse of the Great Curry God will do more than galvanize a trip to the restroom. ) There's also a simple yet potent weapon upgrade dynamic you'll most likely find invaluable, "strange" wards to nervously activate and more enemies than sticks in the world. It's all very, very charming. From time to time, you'll find yourself in possession of key items that you can later "use" while in the town's library. Not that "use" is quite the right word. Whenever you activate one of these pivotal objects, you'll find yourself treated to some utterly bizarre comedy skits, all of which are often seem only tangentially connected to the item in question. I won't go into detail, but suffice to say these brief, ludicrous performances are worth watching for multiple reasons. I don't know if I'd call Sorcery Saga: Curse of the Great Curry God the "stand-out sleeper hit of December 2013" but it's hard not to love this unambitious, competently-built roguelike-lite. Compile Hearts could have gone overboard and plumped it up with unnecessary extras. But they didn't. Instead, they kept Curse of the Great Curry God lean, glazed only with a exuberant sense of humor, excellent voice acting and superbly translated dialogue. I do recommend picking this one up if you're looking for a meaty treat in this no-big-release lull. Now, get out of here before I fling more bad food jokes at you. Are you in the mood for a roguelike-like that is also nauseatingly cute? Want a reason to condition yourself to crave curry for days on end? Need something new to tide you over till Bravely Default floats onto your 3DS? Look no further. Sorcery Saga: Curse of the Great Curry God is excellent albeit not terribly inspired. It keeps to traditional motifs, eschewing more grandiose ideas in favour of a more familiar flavor. Think comfort food except more cerebral.